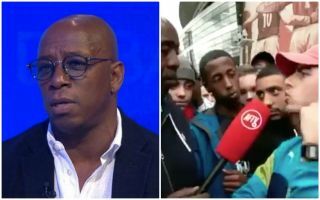 Arsenal hero Ian Wright has taken exception to comments made by one Gunners fan on AFTV after he slammed the selection of legends to face Real Madrid. As seen in the tweet below, Wright couldn’t help but react as one fan in particular singled out former Arsenal ace Anders Limpar and suggested that the club was “scraping the barrel” for their line-up. Limpar spent four years with the Gunners between 1990 and 1994, making almost 100 appearances and winning a league title in 1991. In turn, perhaps it’s a case of this fan not quite knowing his history prior to the Arsene Wenger years, as he was left disappointed that the likes of Martin Keown, Freddie Ljungberg and Dennis Bergkamp were not involved. Wright, and former Arsenal striker Kevin Campbell, were both left unimpressed with his comments, with AFTV host Robbie also incurring the wrath of Wright as he questioned where he’s finding these fans, as seen in the replies blow. As a result, it’s fair to say that the video and comments didn’t go down well, while the Arsenal legends eventually beat their rivals at the Emirates on Saturday in a penalty shootout. For the younger fans though, perhaps he does make a fair argument as there will be many who would love to see more of the more recent legends appear for the club in these charity games to keep it more relevant and improve the quality of the football on show. Scraping the barrel? This joker asked for players from the 90’s who won the title with Anders Limpar in the team. Clown ?